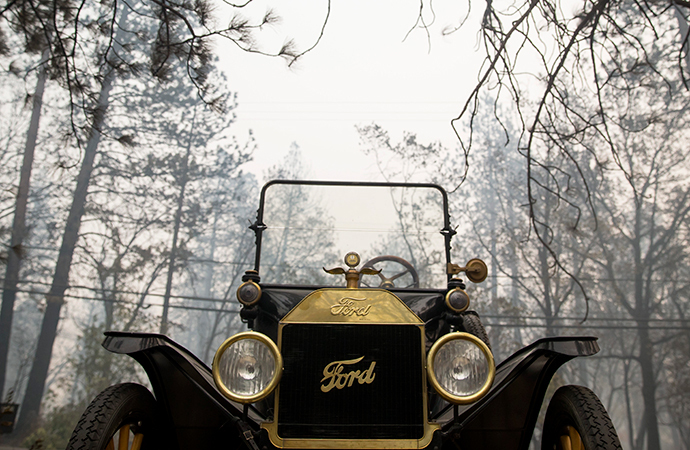 A 1915 Ford Model T abandoned by evacuees as the Camp Fire tore through Paradise, California somehow survived the blaze, despite everything around it burning. Ron Westbrook, 74, told The New York Times he was at the hospital for a checkup following open-heart surgery last Thursday when he heard the fire was bearing down on the town. He and his wife, Bonnie, returned home but only had time to grab a few changes of clothing before evacuating. The couple made the decision to leave their collectible cars behind, including the Model T that had already been loaded on a trailer. “I thought, ‘You know what, it’s stupid to risk a life for a Model T when there’s so many people trying to evacuate,’” he told the newspaper. The couple would later watch their home burn down on CNN. They thought the fire had taken everything, including the Model T.
Somehow, the vintage vehicle survived. Photos taken by Times photographer Eric Thayer showed the car was still sitting on the trailer, ready to be transported away. It was still attached to the Westbrooks’ pickup truck, which also made it through. The Model T appeared to sustain only some minor paint damage. Even the for-sale sign on the back – “Runs Very Well,” it reads – survived. It seems illogical, as the Camp Fire has burned hot enough to melt cars, including a 1941 Plymouth that was parked in the Westbrooks’ garage. Another blaze, the Woolsey Fire, has destroyed entire collections near Malibu. But for Westbrook, the Model T surviving the fire is low on his priority list. Paradise was essentially burned off the map and, as of this publication, at least 56 people have died – it is the deadliest fire in California history – and dozens are still missing. My dad, who died several years ago, bought and restored a 1915 Model T just excactly like this car. But, that was in 1951. He owned it until 1957 and sold it to Skyline Ford in Salem, Or. I just wonder if it’s the same car. I can, and do have an original photo of this car to prove my dad owned this Model T. I’m trying to find out if this car was my dads car. Thank you for reading my comment! John Kosanke.